Enzymatic Therapy AM/PM PeriMenopause is a 2 part Formula that supports energy, weight control and restful sleep. The AM Formula has green tea to support breast health, energy levels and healthy weight management. The PM Formula helps you to relax, and promotes deep sleep to revitalize you. 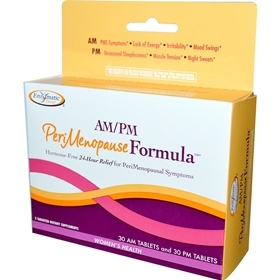 Why use a natural perimenopause formula? To find symptom Relief. This disruption in hormone levels can cause night sweats, occasional restless sleep and lack of energy. Eases the transition to menopause naturally. The herbal ingredients in the formula, including standardized black cohosh, chaste tree berry, and green tea help relieve the symptoms of perimenopause. Most women typically enter perimenopause during their mid 30's to late 40's. Symptoms are similar to menopause. It's a natural defense against irregular or difficult periods, occasionally troubled sleep, occasional flushing, brain fog, and mood swings. The chaste tree berry extract supports natural progesterone balance. The PM Formula supports relaxation, and promotes deep sleep.